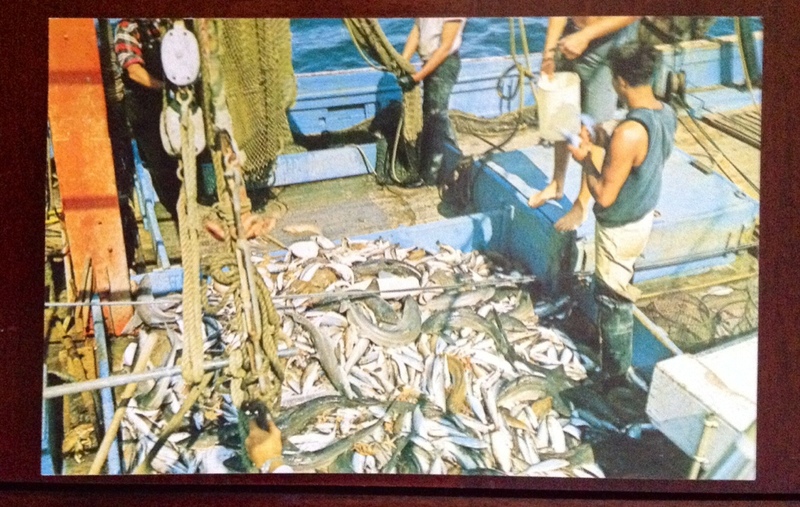 This 1960’s postcard shows a plentiful catch of fish on a commercial fishing boat out of Provincetown. Fifty plus years later and the commercial fishing boats are not as plentiful as they once were, docked off of MacMillan Pier. Still the tradition continues and has been revitalized in recent years with the Portuguese Festival that has enhanced the annual Blessing of the Fleet. The end of June is a great time to visit Provincetown an the celebration begins this weekend on Thursday the 26th. To get into the mood of Provincetown, pick up a copy of Remaining in Provincetown by S.N. Cook , the recently published murder mystery that still has everyone talking. What happens during the Blessing of the Fleet in the story set in the 1980s might give you some clues. A few autographed copies can be found at the Provincetown Bookshop on Commercial Street or buy it online in trade paperback or ebook. Like us on Facebook and keep the conversation going. 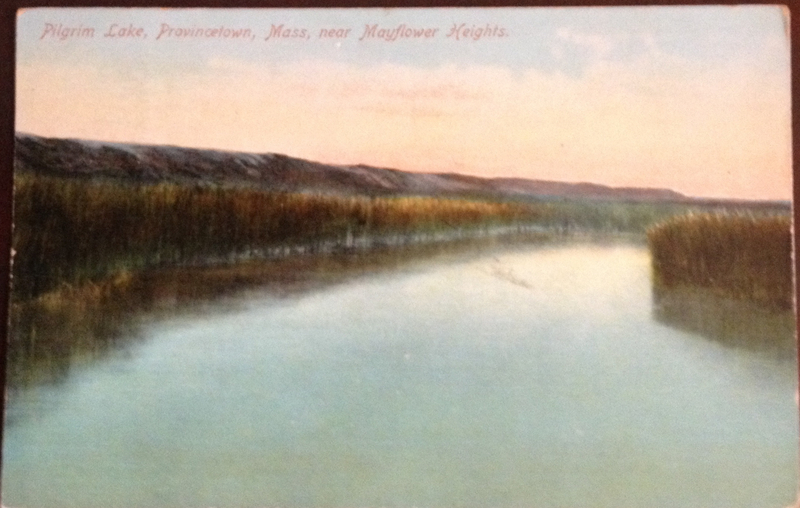 This postcard shows what Pilgrim Lake looked like approximately 120 years ago, but it had already undergone many changes. Once known historically as Eastern Harbor and later as East Harbor, the protected inlet was eventually diked in 1868 to make it possible for track to be laid for the railroad that made Provincetown into a thriving hub for fishing. The railroad took the fish from the Provincetown Wharf all the way to New York City. But in building a railroad and a roadway in 1877, East Harbor became a lake known as Pilgrim Lake. What’s interesting in this old postcard is that the dunes look fairly low and the vegetation is high. The vegetation is what caused the desalination. The fish population gradually depleted although in the mid 20th century there were reports of large terrapin turtles that lived in the lake. What did they eat? The vegetation and wildlife continues to evolve as the National Park Service attempts to restore portions of the habitat. What happens next? Only time will tell. Life is often a mystery. Want to read a novel set in Provincetown? Remaining in Provincetown, “captures the characters and places perfectly,” says one reader review. “Finally an author has been able to successfully capture the flavor of that quirky town on the tip of Cape Cod and do it well,” says another. Available at Provinetown’s favorite local bookstore, Provincetown Bookshop, or online as a paperback or ebook you’ll want to read Remaining in Provincetown by S.N. Cook to get you ready for summer 2014. Like it on Facebook and keep the conversation going. The photograph could have been taken yesterday, but it was taken for a postcard published by the New England News Company in the late 1800’s. Don’t you love the serious expression on these handsome men’s faces? It’s the start of the season for visitors to start arriving for fresh seafood, long walks on the beach and over the sand dunes. There is, after all, no other place in the world like Provincetown on the tip of Cape Cod. Want to get in the mood with an appropriate book? If you haven’t yet read the mystery novel Remaining in Provincetown by S.N. Cook there is no time like the present. It’s available at your favorite local bookstores as well as online in trade paperback and ebook. Like us on Facebook and keep the conversation going! 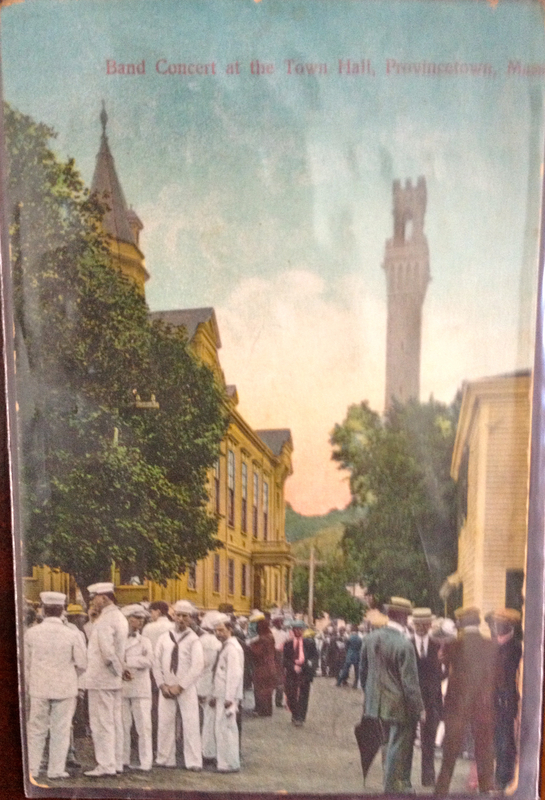 Band Concert at Town Hall is the title of this postcard from the first decade of the 20th century. The Provincetown Monument looms in the background and the corner of Commercial Street is filled with sailors and officers in their dress whites along with tourists and residents waiting for the music to begin. The streets look as crowded over 100 years ago as they do today during the summer season. Want to read a book with Proviincetown as its setting? It doesn’t take place 110 years ago. It takes place in the early 1990s. A murder mystery entitled Remaining in Provincetown by S.N. Cook is available at your favorite local bookstores and online. Like us on Facebook and keep the conversation going. 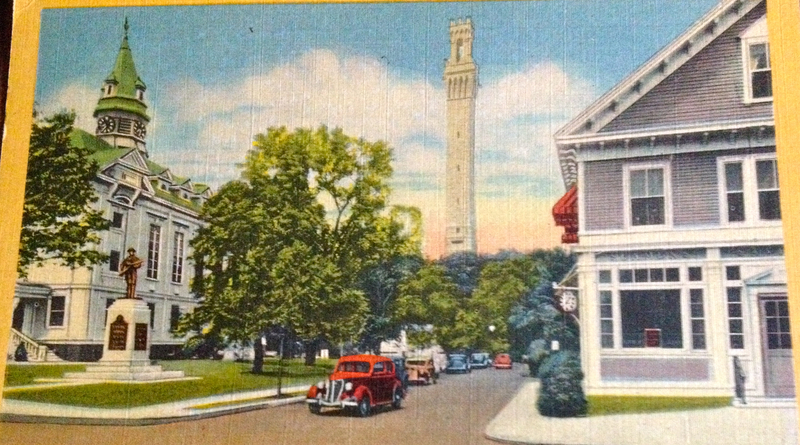 The center of Provincetown in the 1920s looks less crowded with its colorful roadsters, green lawn, and trees around Town Hall. But the architecture is the same as it is today in 2014. 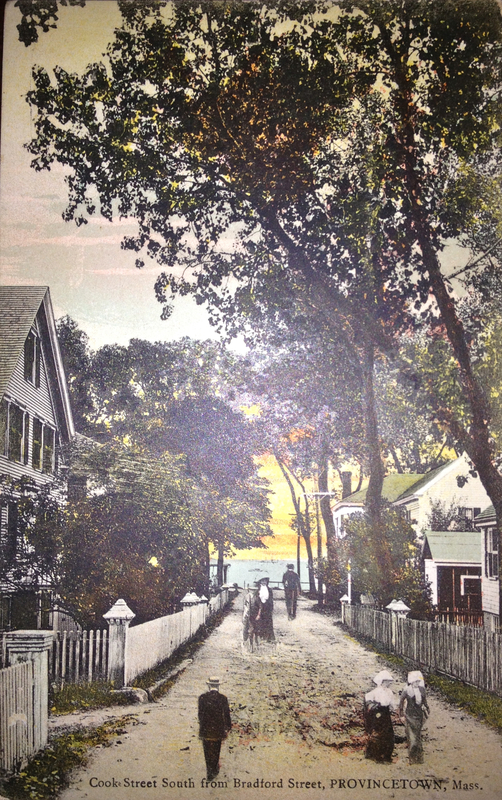 On the postcard from which this picture was taken it says,” Provincetown on the tip of the Cape, is frequently described as being two miles long and two streets wide. The streets are narrow and winding and traffic enters on Commercial Street and returns on Bradford. The Town Crier with his bell is still seen on the streets of Provincetown. ” (The postcard was published by E.D. West & Co.) If you love reading about Provincetown, check out the murder mystery novel Remaining in Provincetown by S.N. Cook., available at bookstores and online in trade paperback and as an ebook. Like us on Facebook and keep the conversation going. Cook Street in Provincetown looking towards Commercial Street. Their singing makes the whole world glad! If you love Provincetown, you should enjoy the murder mystery novel published in April 2013 Remaining in Provincetown by S.N. Cook. Buy it at your favorite bookstore or online in trade paperback and as an ebook. Like us on Facebook and keep the conversation going. 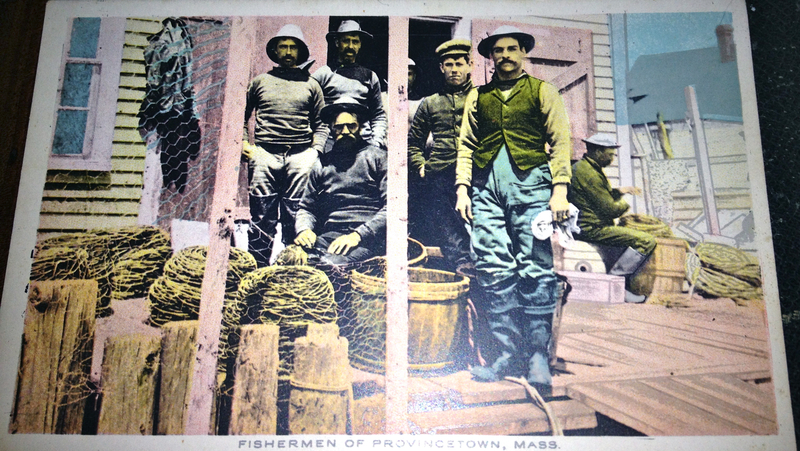 Many of the antique postcards that depict Provincetown, the wonderful small town on the tip of Cape Cod, with sailors walking the streets. The reason for this is because one of the most important events in the town during both 1907 and 1910 was the construction and subsequent dedication of the Pilgrim Monument. In 1907 when the first cornerstone was laid, President Theodore Roosevelt was in attendance. Subsequently in 1910 when the monument was dedicated, the ceremonies were presided over by President William Howard Taft. At both events the entire Atlantic Fleet of the United States Navy was in Provincetown harbor for the ceremonies. That’s a lot of sailors. 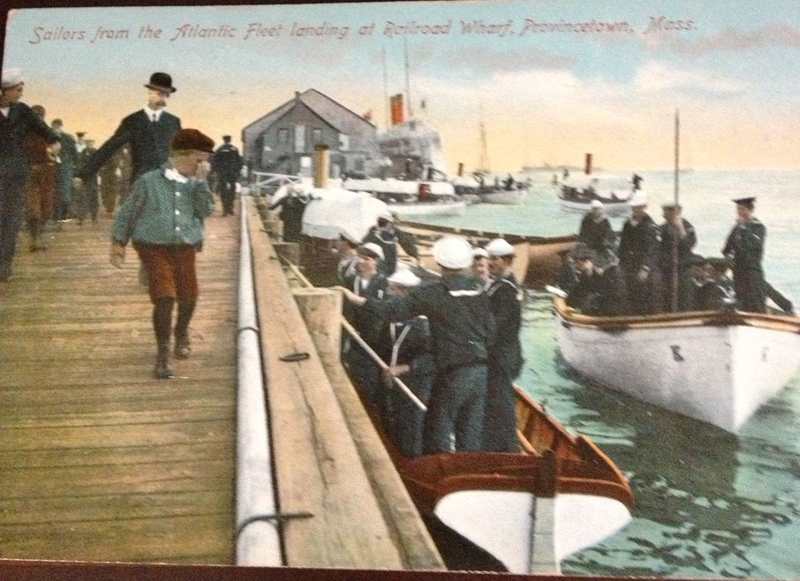 The above postcard shows sailors landing at Railroad Wharf. No sailors walk the streets in the new murder mystery novel Remaining in Provincetown by S.N. Cook but several of the characters are interested in history and tradition. Pick up a copy at your favorite bookstore or order it online at Amazon.com in trade paperback or on kindle. Like us on Facebook and keep the conversation going.